The Blendtec Total is a high performance blender capable of quickly making liquid out of solid food to prepare smoothies, soups, butters, spreads, etc. Top blender, our most recommended model and brand. We found Blendtec Total to be very easy to use and clean. It is perfect for making a quick but delicious breakfast smoothie when in a rush. It has a strong motor for durability and perfect results every time. The Blendtec brand is known for their sturdiness and durability, and the warranty program is generous (lifetime on blades, 8 years on motor). A nice added bonus is the comprehensive Blendtec recipe book with quick “90-seconds” recipes. 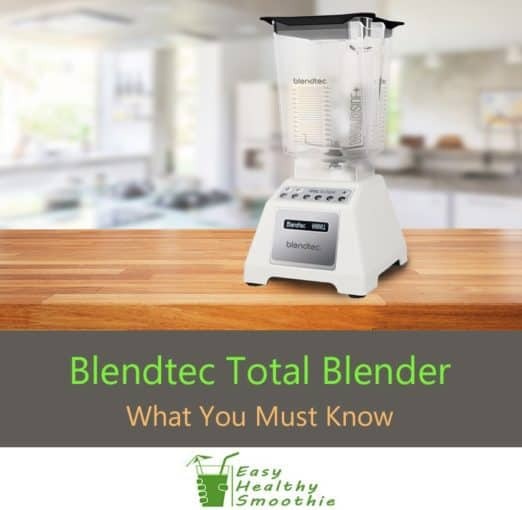 The Blendtec Total is a good choice if you want a blender that’s easy to use and quick to clean, versatile and offers very high quality results. However it’s not a good choice for you if you’re on a tight budget, if you don’t like the modern touch-button design, or your ears are very sensitive to noisy appliances - more on this below. Why go for the Blendtec Total? Is Blendtec Total Right For You? What blending controls are available? What type of material is the jar made of? Where to buy the Blendtec Total? Before we go into the important points to consider when purchasing a blender, let’s have some fun with Blendtec’s famous “will it blend?” video series. To get the weight loss and health benefits of smoothies, I realized a long time ago that I need to incorporate smoothies as part of my nutrition on a daily basis. But to stick with smoothies, they need to have that addictive flavor and texture. After using a basic blender for some time, I got the chance to taste a smoothie prepared with a Blendtec blender - I was immediately hooked. Ordinary blenders are not really built for daily usage and quality results. They tend to break down quickly, and also lack the power necessary to shred and blend all ingredients effectively enough. Their smoothies don’t have that smooth, delicious and addictive texture. I’m hearing time after time how people who are serious about smoothies are frustrated and disappointed with anything less than the quality blenders. To cut a long story short, this is my full Blendtec Total blender review. Blendtec Total is a high end countertop blender, manufactured by an American family-owned company. ​These points will help you decide whether the Blendtec Total is the right choice for you or not. 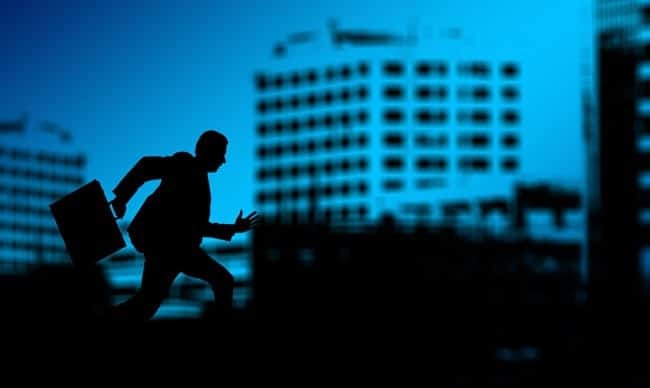 Also check out the Key features and benefits section. You prefer a modern design with a touch pad over traditional round buttons. Quick cleaning is important to you - just pour water and a little soap, let it run a few seconds then rinse - that’s it. Jar is dishwasher safe, unlike most Vitamix models and some cheaper blenders. You’re making smoothies in a rush - just toss ingredients inside and press the button for the automated pre-program. A digital timer counts up the time till the mixture is ready, while you prepare to go. You're on a tight budget. Consider buying a refurbished Blendtec Total. It’s a lightly used demonstration unit that has undergone a complete checkup by Blendtec technicians, and comes with 7 years manufacturer warranty and a brand new jar. This is in my opinion the best value you can find. For even tighter budgets, go for a bullet blende﻿r. Your ears are very sensitive to noise. The Blendtec Total is not a very quiet blender, but unless your ears are very sensitive to noises, then the noise is manageable. Interestingly, the newer Wildside and Wildside+ pitchers seem to be less noisy, so it’s worth buying the blender with this kind of pitcher instead of the Fourside pitcher. Bear in mind other high end models are even noisier than the Blendtec Total. You might prefer either the pricey Blendtec Pro 800, which is the absolute quietest blender available, or the cheaper Vitamix 1363 CIA. If you’re looking to make smoothies at home, the machine you’d want to own is a blender, which is designed to turn solid food into a drink. However, for people whose digestive system is too sensitive to handle a lot of fiber, buying a juicer might be a better alternative, since juicers remove all the pulp (and lots of nutrients) from the fruits and vegetables, while blenders leave them in. You can make a smoothie with any blender. However top of the line blenders work faster, more efficiently, and are easier to clean. These higher quality blenders are able to produce smoothies with a delicious smooth texture that’s addictive, as well as incorporating ice and other difficult-to-process ingredients. You can even make nut milks, nut butters, yogurt, and more. I’ve found that blenders with a motor power lower than 800 watts can sometimes give okay results, but if you want really smooth blends that will knock your socks off, then above 800 watts would be a better choice. If you’d like to have more control over the blending process, variable speed is important, but no need to go overboard. 5 speeds with Pulse are enough. Plastic - the preferred choice. It is shatter resistant, lightweight, easy to handle and clean. Just ensure it is of the “BPA Free” type, which is considered safer for food usage. That's the type of pitcher that's shipped with the Blendtec Total. Glass - heavy, less convenient to handle and clean than Plastic. It is also less safe to use with powerful blenders. If a metal object such as a spoon, were accidentally left in a glass jar, it could shatter and potentially cause injury. ​Stainless steel - the alternative if you don’t like the idea of preparing food in any sort of plastic container, or dislike how plastic containers look scratched up over time. It is less popular due to the fact that you can’t see the contents while it is blending. If you do not intend to use the blender frequently, it might seem questionable to invest too much in it. ​Blenders range in price from under $100 to over $1000 and everything in between. Generally, with cheap blenders I’ve heard everything from motors quick to burn out and non-smooth smoothies, to plastic chips from the blender getting into the food. If you’d like to own a quality blender but are on a tight budget, a refurbished high-end model could be a great idea. Some blenders come with family-sized jars, while other are single or two serve. Be sure to check the size will match your family's need, especially if you have kids - this is your best bet at bringinging them healthier, nutrient-rich food that they would actually like! Size also matters when it comes to storage. Blendtec Total has a small enough profile to be stored on the kitchen countertop under most kitchen cabinets. The Blendtec Total is designed not just as a stylish appliance for your kitchen - a lot of thought is given to functionality, saving you time and effort. 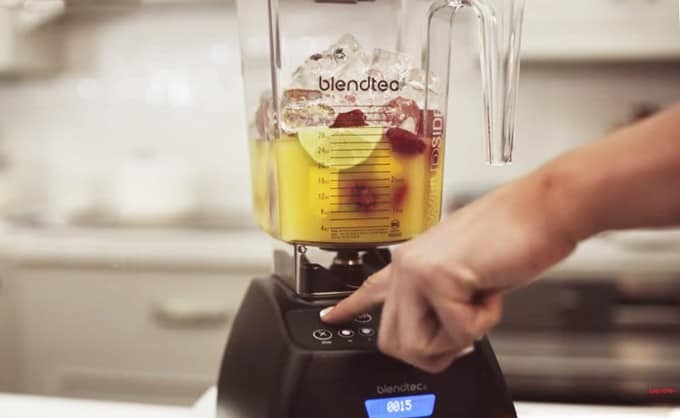 The Blendtec Total provides a selection of pre-programmed settings called “blend cycles” that include: smoothie, whole juice, hot soup, butters, etc. This means that you get the same quality result each and every time. However what’s really great about it - how it makes it easy to prepare delicious smoothies when you’re short on time. It has non-removable blades, which means you can do everything quicker - it eliminates a step before using the blender, as well as steps before and after cleaning it. The touch buttons design is another great feature because it is much easier and quicker to clean than traditional dial buttons. It’s also free of crevices so no food particles get stuck, which can get annoying with other blenders. It’s a pleasant surprise to find the comprehensive cookbook and DVD delivered with the Blendtec Total. This free book is a really great value add. The Blendtec recipe book is 213 pages long and contains great tips, ideas, and of course the famous Blendtec recipes. This really brings the point home of how versatile the Blendtec Total is. Most of the recipes are quick “90-second” ones, which is especially useful if you don’t have a lot of time to spend in the kitchen. The motor is extremely powerful at 29,000 rpm with over 1500 watts, strong enough to turn ice into snow in no time, and turn your ingredients into the smoothest possible smoothy. The smooth texture of the blend is one of the things I really like about the Blendtec. One of the qualities that might appeal to you is Blendtec’s versatility - it replaces other kitchen appliances so it saves kitchen space, avoids the clutter of multiple appliances and of course the expense of buying them all. ​The Blendtec can double as an ice-cream maker, coffee grinder, grain mill, hand or stand mixer, and even food processor if you’re not doing grating but mostly salsas, hummus and dips. Lifetime warranty on the blades means no worries about the blades getting dull over time. This was one of my top concerns with the other blenders. This is important especially because I’m using it daily, and with ice or frozen ingredients. Before writing this review, I’ve scoured the internet to look for reviews from verified buyers. Most of the reviews are positive, if not totally praising. The overwhelming majority gave the maximum of 5 stars, with only a minority rating 1-2 stars. Most of the complaints revolved around the noise level of this blender, although I think it is comparable to most other blenders of similar category. Another complaint was regarding the “Fourside” jar that might leak after about two years of daily usage. Note that in case this happens, the jar would still be within its 8-year warranty period. Vitamix blenders are fierce competition to Blendtec, with similar performance and an equal crowd of admirers. If Blendtec and Vitamix are not within your budget, a refurbished model could be a great solution. We have a complete review on this here. If you’re looking to eat more healthy or use smoothies to help in your efforts to lose weight, then the Blendtec Total is a very good choice, since it is easy to use, durable and makes smoothies of a higher quality than cheaper blenders. Buying through Amazon, apart from being convenient, enables you to check out user reviews and contribute yours, and you get a selection of sub-models, colors and even refurbished options. If you’re using the Blendtec Total please share your experience with the community using the comments below. And, if you liked this review it could be useful to others as well - share it on social media using the buttons below. Thanks for sharing your experience with Nutribullet and blendtec. It’s definitely a step up. Blenders are generally noisy, but IMHO it’s a small price to pay for the amazing contribution to our health and quality of life. Couldn’t agree more about investing in our health, Max! Glad you’re enjoying your Blendtec 🙂 Thanks for weighing in!